The 2012 Subaru Impreza 2.0i 5-Door Sedan holds a 2.0L 4-cylinder engine, a continuously variable transmission, and up to 36 highway mpg and 27 city mpg. Inside, it's roomy and comfortable in that it uses traditional colors and material choices to provide the driver a more-than-acceptable environment. The vehicle's exterior is another matter. The 2012 Subaru Impreza makes for a disorienting finished product, which is, admittedly remarkably more pleasing than last year's model. Regarded as the most fuel-efficient all-wheel drive vehicle in America, the Impreza comes standard with Subaru's Vehicle Dynamics Control (SVDC), which combines stability and traction control functions. All models are also equipped with ABS, Electronic Brake-force Distribution (EBD) and the Brake Assist safety system. Additional safety features include stability and traction control, front and rear head airbags, child seat anchors, daytime running lights, a remote anti-theft alarm system, ventilated front dis and solid rear disc brakes, rear door child safety locks, an engine immobilizer, a whiplash protection system, passenger airbag occupant sensing deactivation, and a tire pressure monitoring system. There's no doubt that the 2012 Impreza is, in fact, better looking and offers better fuel economy than its predecessor. We're not sure, however, if we can believe Subaru's assertion that it's also faster. The revised car lost a maximum of 165 pounds, lost 22 horsepower in its 2.0-liter, and lost and 25 lb.-ft. of torque compared to the old 2.5-liter. 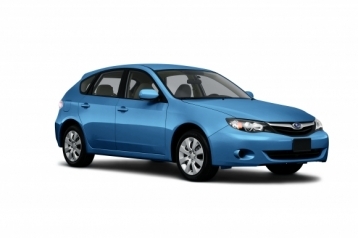 The 2012 Subaru Impreza 2.0i Premium 5-Door Sedan comes with a fantastic warranty package and several comfort-enhancing features and technology features. Some of these include: various impressive storage options, climate control, AM/FM in-dash CD player with CD with optional MP3 integration, and available USB connection. Overall, the 2012 Subaru Impreza 2.0i 5-Door Sedan impresses us with its increased fuel economy, roomy interior, and standard AWD.